The first modern Olympics to hold equestrian events were in 1900 in Paris, France. Three disciplines were contested: ​Showjumping, high jump, and long jump. 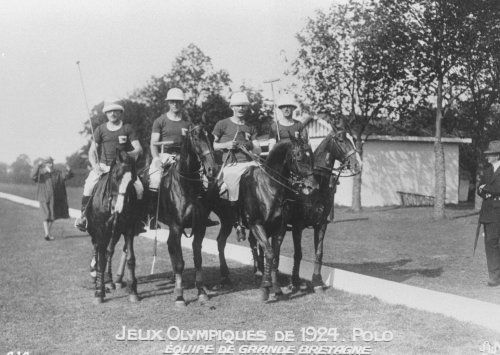 Hacks and hunters (Chevaux de Selle) and mail coach were contested but not considered official Olympic sports. Several horse sports have made their appearance in the Olympics since those beginnings and the ancient sport of polo was contested at the 1924 Olympic Games in Paris. This picture is of the bronze medal winning British polo team. Horses Arriving at the Docks for the 1932 Olympics. It's important for those caring for competition horses to understand the stresses of transport and climate change. These horses being shipped to the 1932 Los Angeles Olympics would have endured a lengthy and uncomfortable ride. While the trip today takes less time thanks to air travel, that too has risks. Adequate time for rest and recovery is a necessity. The high altitude of Mexico City was a consideration during the 1969 Olympics. The heat and humidity of the 1996 Olympic Games in Atlanta was a major concern sparking research that has continued to benefit the horse world. Beijing has gone to great lengths to ensure that horses are well cared for in the heat, and from poor air quality. This photo is of a competitor passing uniformed judges during a three-day event competition at the 1928 Olympic Games in Amsterdam, Netherlands. Formidable looking jump judges such as these would inspire me to make great speed to the next jump! But jump judging hasn't changed greatly, as it still requires a person to decide if the horse has cleared the jump without behavior that would incur a penalty. Does one gentleman hold a stopwatch in his hand? Like in any timed sport, timing equipment has become more accurate and riders wear digital watches with large readouts so they can stay within the 'optimum time'. Here is another photo of an eventer riding in the three-day event competition at the 1928 Olympics. Olympic three-day eventing included a 'roads and tracks' phase which was a timed distance event through trails and roadways and a steeplechase phase. Both roads and tracks and steeplechase were discontinued and focus was put on cross-country jumping, show jumping and dressage. Prior to 1952 Olympic riders were commissioned officers. Until 1952 women and civilians were not permitted to take part in the Olympic Equestrian events. This picture is of Heinrich von Moers of Germany in the show jumping phase of the Three Day Event competition during the 1912 Olympic Games in Stockholm, Sweden. Now a very important part of show jumping dress is a helmet! Prior to 1952 women were not permitted to compete in the Olympic Equestrian events. The door was opened at the Helsinki Olympics where Lis Hartel won an individual silver medal in dressage. She repeated her win in 1956 when the equestrian events for the Melbourne, Australia Olympics were held in Stockholm, Sweden due to Australian quarantine regulations. Her accomplishment was more remarkable because Hartel had overcome polio and was still paralyzed from the knees down. While the sports themselves have changed very little over the years, the consideration for the welfare and safety of both human and equine competitors has become a priority. New materials and technology allow the design and manufacturing of protective equipment for horse and rider. Helmets and chest protectors have become standard gear for the cross country jumper. Bell boots and other leg guards and bandages help support horse's legs. Leg grease helps horses slither over jumps they may otherwise get caught on. A greater understanding of metabolics and what is required to maintain the equine athlete helps to ensure longevity in the sport. Course designers are always striving to build jump and cross country courses that are challenging, yet as safe as possible. I couldn't resist including this photo even though it was taken during the 1928 Winter Olympic Games in St. Moritz, Switzerland. Over the years equestrian events have been included in the Winter Olympics. Skijoring is depicted here, and other sports such as flat racing have been included as demonstration sports. Voltage (vaulting or artistic riding) was included in the 1920 Olympics. The Fédération Equestre Internationale (FEI) began in 1921 due to the need for a governing body for horse sports. Since then the FEI has become the authority for all international events in dressage, jumping, three-day eventing, driving, endurance, vaulting, reining and Para-Equestrian although only dressage, jumping and eventing are contested at the Olympics. Early in modern Olympic history, horse events like flat racing, 'artistic riding' and skijoring were included. Flat racing on snow is still done in northern Europe.